✔ Indoor and outdoor activities! 1. 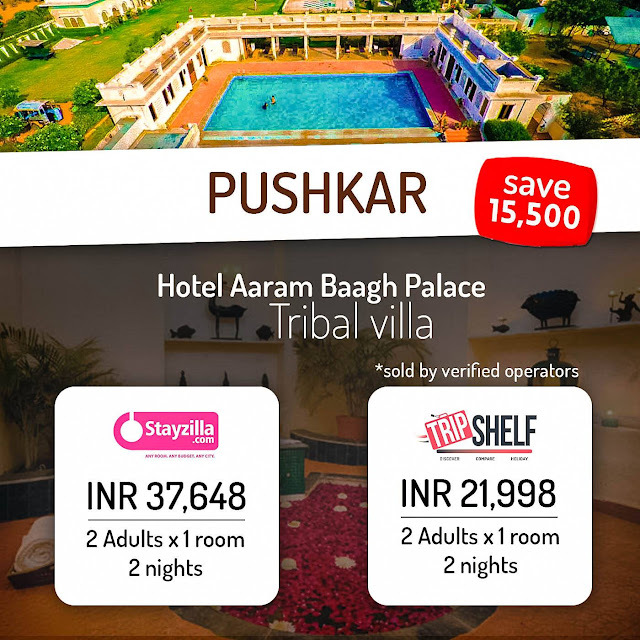 Aaram Bagh, Heritage Resort, Pushkar @ Rs.10,999 / Rs.12,999 per person. Book now by paying Rs. 2500/- pp. BOOK NOW HERE. Price on Tripshelf for Aarambagh Pushkar is INR 15650 cheaper! ✔ 02 nights 03 days stay in Persian/Egyptian/Greek or Tribal Villa (checkin: 30 Dec 2016, checkout: 1 Jan 2017). ✔ New Year Eve Gala Dinner & Fireworks on 31st Dec.
✔ Lot of Prizes like Best Couple / Best Dancer / Best Dress etc. Call Kajal at 8882228578 to book or call Dhruv at 9555519919. 2. Aaram Bagh, Heritage Resort, Pushkar @ Rs.7,999 / Rs.6,999 per person. Book now by paying Rs. 2500/- pp. BOOK NOW HERE! ✔ 01 nights 02 days stay in Persian/Egyptian/Greek or Tribal Villa (checkin: 31 Dec 2016, checkout: 1 Jan 2017). To block your seat, make an advance booking payment of Rs.2500 per person at Link-- bit.ly/TSAdvance2 (balance amount to be paid by 5th December). Trip designed, operated and sold by verified operator. Book from Tripshelf and get INR 1000 Cashback per twin booking + Free Photography Class. Don’t Even Think about Rishikesh This Winter!